The refrigerator compressor is both a motor and a pump that move the refrigerant through the system. Temperature sensors signal the compressor to start when the temperature inside the refrigerator rises above its set point. No refrigerator is completely airtight; cold air leaks out, and warmer air leaks in, causing the temperature to rise above its set point. 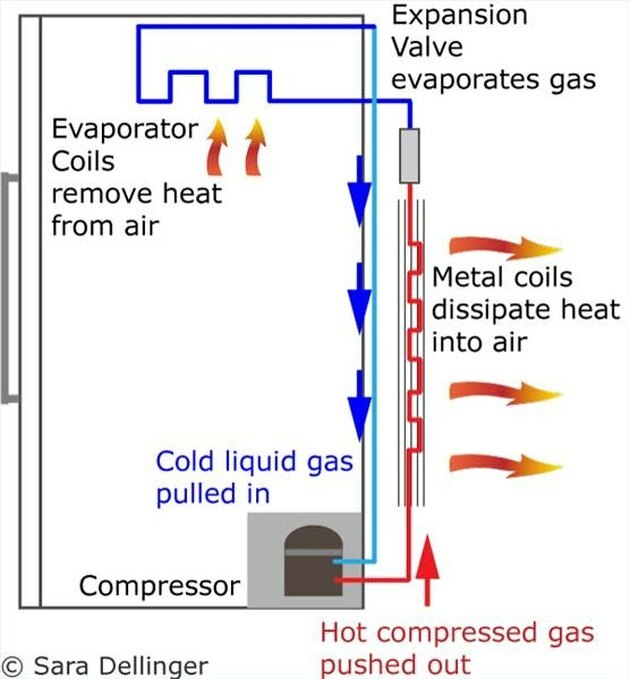 As the compressor starts, it draws in the cold refrigerant gas in liquid form as it leaves the evaporator. Refrigerators use a type of refrigerant gas that turns into a liquid at very cold temperatures: -15.9 degrees Fahrenheit (-26.6 degrees Celsius). The compressor then puts pressure on the gas---compressing it. As the gas is compressed, its temperature goes up. The compressor pushes out the hot, compressed gas through the outside metal coils (tubes) on the back or bottom of the refrigerator. These coils allow the heat to dissipate into the surrounding air. Because it is under pressure, the gas changes into a liquid as it cools. The liquid gas continues to flow through the system until it reaches the expansion valve. The valve forces the liquid through a very small hole, turning it into a very cold mist, which evaporates as it moves through the freezer coils. This evaporation occurs at -27 degrees F (-33 degrees Celsius). As the cold liquid gas moves through the coils, it draws heat out of the surrounding air in the freezer and refrigerator compartments. This is based on the second law of thermodynamics: heat moves from warmer objects to colder objects. The colder object is the evaporating gas, and the warmer object is the air. The coils lead back to the compressor. When the liquid reaches the compressor, pressure is applied. The compressor sends the hot gas back through the outside coils to release heat into the air. 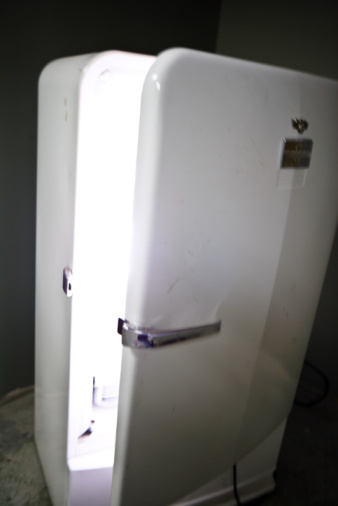 The process of compression and evaporation continues until the refrigerator temperature has returned to its set point. Once the temperature is at its set point, the temperature sensors signal the compressor to stop. A professional writer since 1992, Sara Dellinger creates training materials, e-learning courses, product packaging and use/care guides at a marketing agency. Her eHow articles focus on health, lifestyle and Internet/technology. Dellinger has a Bachelor of Arts in communications and political science from Western Michigan University and attended Boston University/l'Ecole Française des Attachés de Presse in Paris.